With Cinco de Mayo approaching it's time for a fiesta! It’s a time to pull out the sombrero, dance, eat and enjoy good times with family and friends. 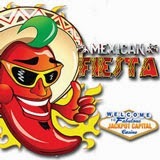 Jackpot Capital Casino is throwing a massive Mexican Fiesta during which they'll give away $100,000 in prizes. All you have to do to win bonuses and free spins is play any of the hundreds of Realtime Gaming games they offer online and in their mobile casino. With $100,000 to be given away over the next few weeks, it’s also a good time to pick up lots of bonus cash at Jackpot Capital Casino. Jackpot Capital Casino players earn points just by playing any of the hundreds of online casino games that it has to offer. Players are ranked by their points and current rankings are displayed on a Scoreboard. Every Monday until May 17th, 200 players will receive bonuses up to $500 each. The top players receive top bonuses, but every Friday another $5000 in bonuses is randomly awarded so everyone has a chance to win. When you're at Jackpot Capital Casino be sure to check out their new Lucha Libre wrestling-themed slot game. It just launched just yesterday in both the online casino and the mobile casino. Every week 200 players win up to $500 each during Mexican Fiesta.